You can see the best of Beaufort County for less than $40! In today’s economy, the expense of travel can make the very thought of a vacation intimidating. If you’re looking for an trip itinerary that won’t break the bank, come to Beaufort County, N.C.! Here are 15 things to do that won’t cost you more than $40 in total. 1. Rent a bicycle at Inner Banks Outfitters. A sporting supply shop, Inner Banks Outfitters allows the thrifty visitor to tour Washington by bike for four hours at $15. Get the Pamlico River breeze in your hair and see Washington the way locals do. 2. Visit the North Carolina Estuarium. With over 200 exhibits, aquariums and works of art, the Estuarium is dedicated to the unique ecosystem of eastern North Carolina’s estuaries and their effect on local culture. Fun, interactive and kid-friendly, check it out for only $4 for adults and $2 for students. 3. Take a river-roving boat tour of the Pamlico River. This educational tour given by the North Carolina Estuarium is free, but advanced registration is required. Make sure to take advantage of this great, free opportunity by reserving your spot A.S.A.P.! 4. Schedule a free, private program with a park ranger at Goose Creek State Park. Drawing on their vast experience, the rangers present programs and activities that suit the unique needs of each audience, free of charge. All you have to do is contact the park at least two weeks in advance to schedule! 5. Take a hike in Goose Creek State Park. Eight miles of hiking trails meander through estuarine areas with diverse flora and fauna. See who can spot a deer first! 6. Swim in the Pamlico River. Cool off in the river that defines this region! At Goose Creek State Park, a designated swimming area with a sandy beach offers access to the shallow waters of the Pamlico River. 7. Catch some air at PCM Skatepark. This outdoor skatepark is publicly-owned, so visitors can skate for free! 8. Hear local musicians jam to traditional tunes. The Beaufort County Traditional Music Association holds weekly jam sessions on Thursday nights and Saturday mornings at Union Alley Coffeehouse, a coffee bar and performance space located inside the Inner Banks Artisans’ Center. An informal event, all are invited to play or listen! 9. Dig for Fossils at the Aurora Fossil Museum– Featuring an outdoor dig site, the museum showcases 5- to 15-million-year-old marine fossils from the nearby PCS Aurora Phosphate mine and native American artifacts from across prehistoric North Carolina. And guess what? Admission is also free! 10. Visit the Belhaven Memorial Museum. Located on the second floor of the historic Belhaven Town Hall, the museum is built upon the eclectic collection of Mrs. Eva Blount Way. See it for free! 11. Take a historic home tour in North Carolina’s first town. Historic Bath, home of more “first’s” than any other North Carolina town, offers tours of the historic Palmer-Marsh and Bonner houses for $2 adult admission and $1 student admission. 12. Walk the history of Washington. You can get the book with the self-guided historic Washington walking tour for free at the Washington Visitor Center. The spiral-bound book features beautiful photos of the historic landmarks and makes a perfect souvenir. 13. Rent a canoe at Pamlico Sea Base. If you’re interested in paddling the Pamlico yourself, Pamlico Sea Base offers weekend canoe rentals in which for $15 per canoe, you can rent one from Friday evening to Sunday afternoon. Whenever you want to use it is your prerogative! 14. 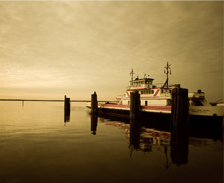 Cross the Pamlico River by ferry– This free ferry ride offered to commuters and tourists alike is a fun and free way to see the beautiful river and feel the breeze! See the sun reflect off the river at sunset for an unforgettable crossing. 15. Visit St. Thomas Episcopal Church. Located in Bath, St. Thomas is the oldest church building in North Carolina and a must-see for lovers of historic buildings. You can even attend a church service if you like since it is still a fully-functioning church! And, of course, it is absolutely free to tour. So there you have it! Who says vacations have to break the bank? For less than $40, these activities encompass the essence of Beaufort County on a budget.